Well, here's a lesson for me. When I first saw that this book had made the Booker Prize longlist, I was thrilled. I had read the author's Small Island when it first came out some years back and liked it so I was eager to get into this one. Then, when I picked it up and started reading it, I was a bit unsure, because my first thought was "oh no, another book about slavery." There's a story behind that remark: about a year ago, I had read a book about slavery that was emotionally difficult to get through called The Book of Night Women, by Marcus James and frankly, I didn't think I could go there again. 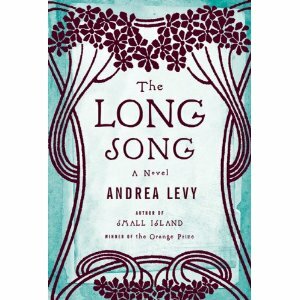 But The Long Song was not at all what I was expecting -- and I ended up being unable to put it down. And while I didn't love it, I liked it very much. Although shy of the task at first, after several months she soon became quite puffed up, emboldened to the point where my advice often fell on to ears that remained deaf to it. And really, July holds nothing back; indeed sometimes her zeal leads her to fabricate, but manages to rein in the "nice" version of her stories to get back to the reality of her life in Jamaica. She belongs to John Howarth, master of Amity, and works out in the fields until the arrival of Howarth's sister, Caroline Mortimer. Caroline brought a maid with her from England, but the maid dies shortly thereafter, and Caroline decides to take July in her maid's place. Inside the house, the mischievous and often devilish July is given the name "Marguerite," and with the other house servants, does everything she can to thwart Caroline, including putting a soiled bedsheet on the table instead of the best tablecloth for a company dinner. Her time at Amity runs through The Baptist War or Christmas Uprising of 1831, as well as through the eventual emancipation of all of the slaves in 1838. In the meantime, a string of overseers come to Amity, ending with Robert Goodwin, whose arrival changes everything about life at the plantation. Only with a white man, can there be guarantee that the colour of your pickney will be raised. For a mulatto who breeds with a white man will bring forth a quadroon; and the quadroon that enjoys white relations will give to this world a mustee; the mustee will beget a mustiphino; and the mustiphino...oh, the mustaphino's child with a white man for a papa will find each day greets them no longer with a frown, but welcomes them with a smile, as they at last stride within this world as a cherished white person....Forward only to white skin became Miss Clara's mission. I can go no further! Reader, my story is at an end. Close up this book and go on about your day. You have heard all that I have to tell of a life lived upon this sugar island. This wretched pen will blot and splutter with ink no more in pursuance of our character July. I now lay it down in its final rest. But thankfully, she does go on, until her "long song" is finished. 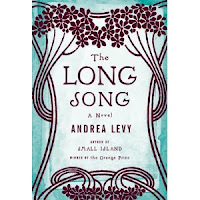 I appreciated the fact that Ms. Levy might have chosen to bring a sappy ending to this story that might have diminished this novel and did not, thereby maintaining the integrity of The Long Song until the final word. I can definitely recommend this book -- it is powerful, extremely well written and it's a story you won't soon forget. I liked this book too, but I didn't love it. I totally know what you mean by the 'oh no, another book about slavery'. Haven't read this title, but I read a few novels in that arena a few years back and, right or wrong, I have generally avoided the topic for the last couple of years. The subject matter can be so emotionally draining... but in a way I am glad that topic still has that effect on me - if it didn't I would be concerned. When I am ready to venture there again, sounds like this may be a good place for me to start - great review. I am so glad that you recommend this. I really can't wait to read this one. Suzanne: I'm with you. I didn't love it either, but it's quite good. I probably would have bought it eventually just on the strength of her Small Island, but it wouldn't be on my list of must-read books. Jo: Thanks! I feel so politically incorrect saying that I didn't want to read another book on slavery, but it is what it is. Aths: I think it's something you'd really enjoy. And thank God it didn't get sappy! I really have been wanting to read this book...thanks for the review. It's Agatha Christie's Birthday -- happy 120th!